Earlier in the week I made pizza for dinner, but as I mentioned in the blog post, my recipe made two small pizzas. 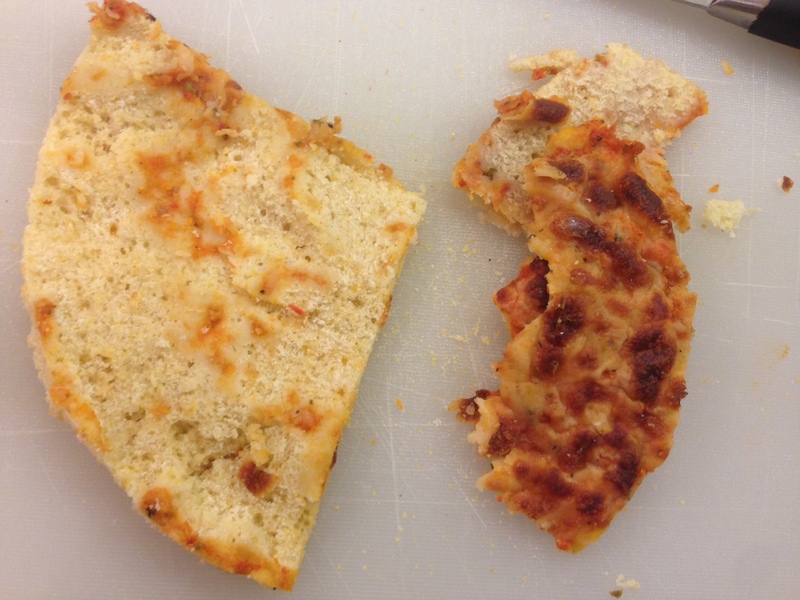 I ate one of them, but had a whole small pizza left over and I wanted to come up with a clever way to repurpose it. I started Googling “leftover pizza recipes” and “creative ways to repurpose leftover pizza” but was unimpressed with the results. Most of the recipes I could find were for frittatas, quiche, or croutons. They were all pretty basic, and I wanted to do something more interesting with my leftovers. Hell, I made both the sauce and crust from scratch. 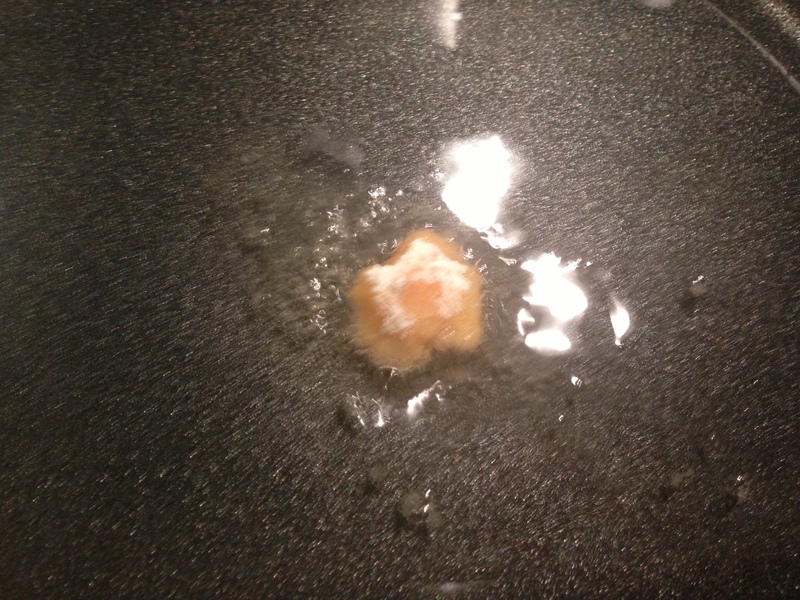 I couldn’t do it the dishonor of just pouring egg over it and tossing it into the oven. 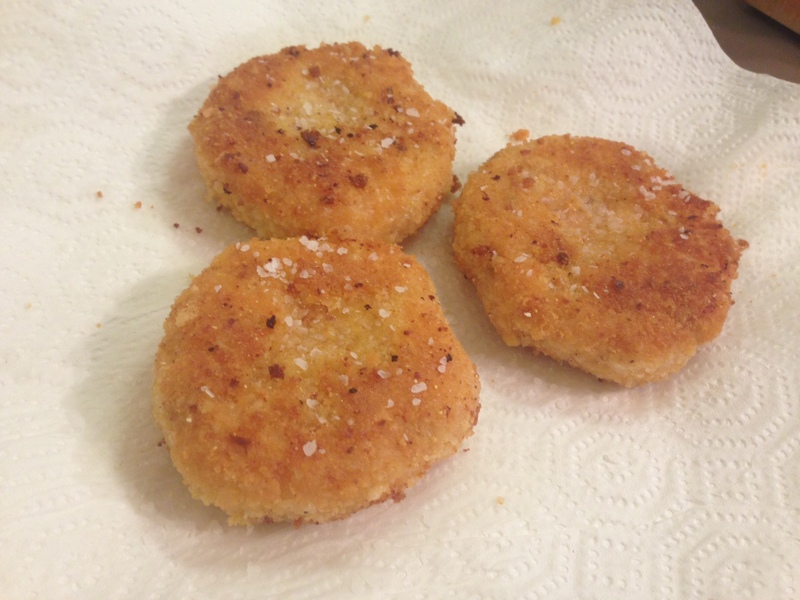 I finally decided to go with potato cakes because it would allow me to repurpose three different parts of the pizza. 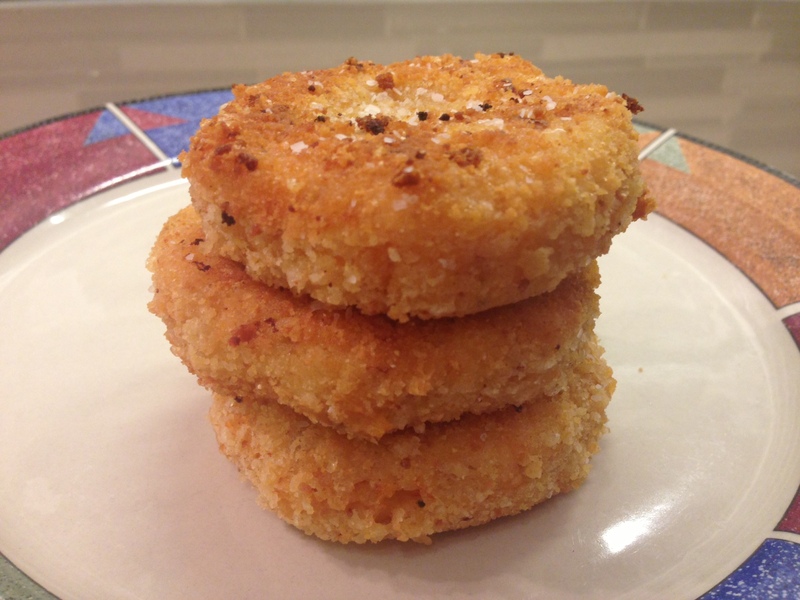 1) I could use the sauce and cheese for flavoring inside the potato cakes, 2) I could use the softer bread from underneath the toppings for bread cubes to also go inside the cakes, and 3) I could turn the crusts into breadcrumbs to coat the cakes. Without any guarantee of success or good flavors, I began my culinary adventure. 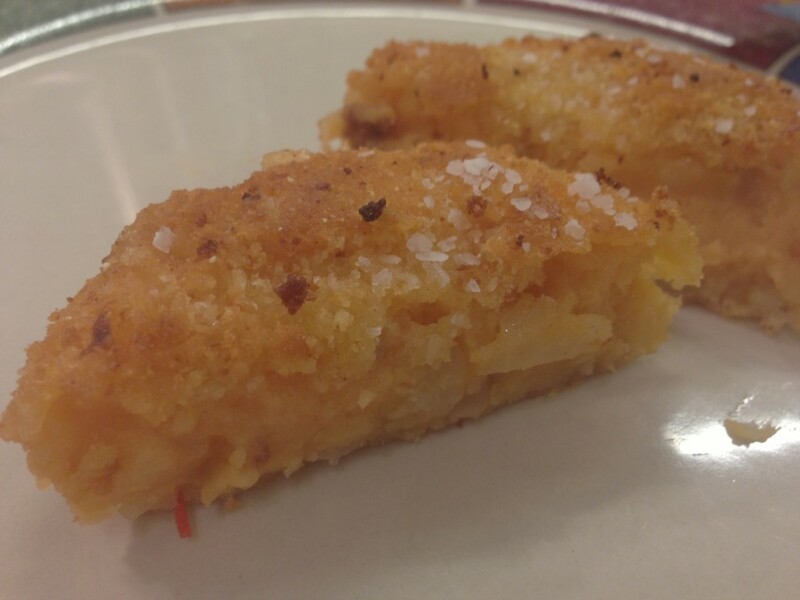 I did have to make a few tweaks to my recipe along the way, but the results were incredible. 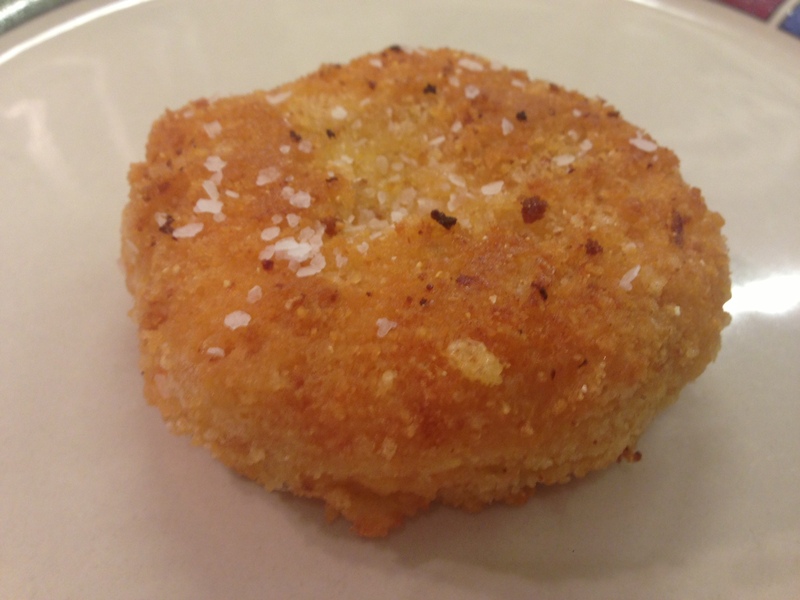 Seriously, these potato cakes are amazing. 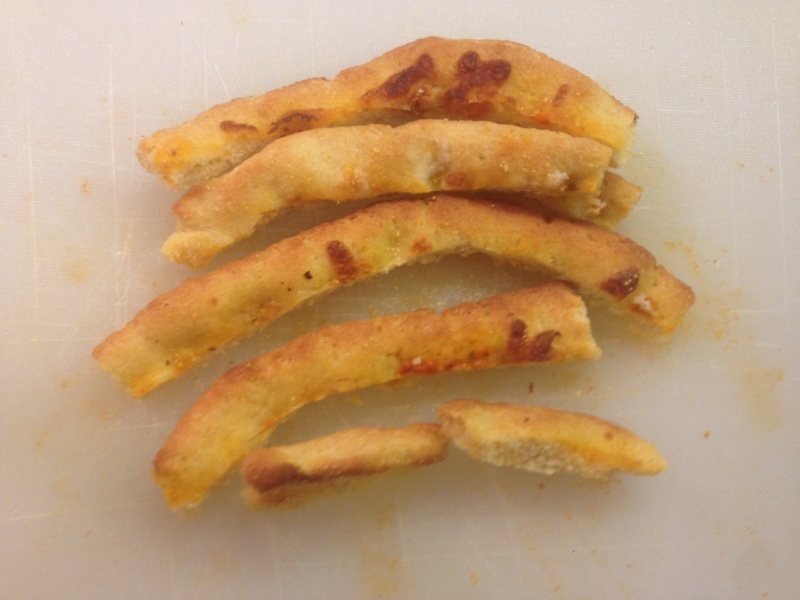 The crusts made for a delicious bread crumb coating; very crispy and delicious. Plus the inside is infused with the pizza flavor, so when you bite into the cakes you get the taste of the tomato sauce, cheese, and crust, but in a unique way. Although I probably won’t go to these lengths every time I have left over pizza (the whole process took well over an hour), I definitely recommend trying this recipe. Especially if you find yourself with a few extra slices of pizza and some time to kill. 1. 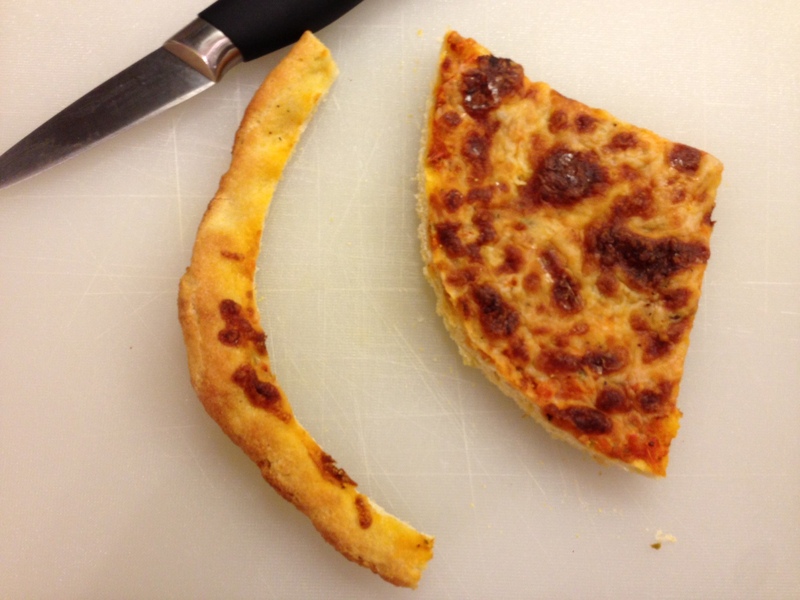 Begin by breaking down your pizza. 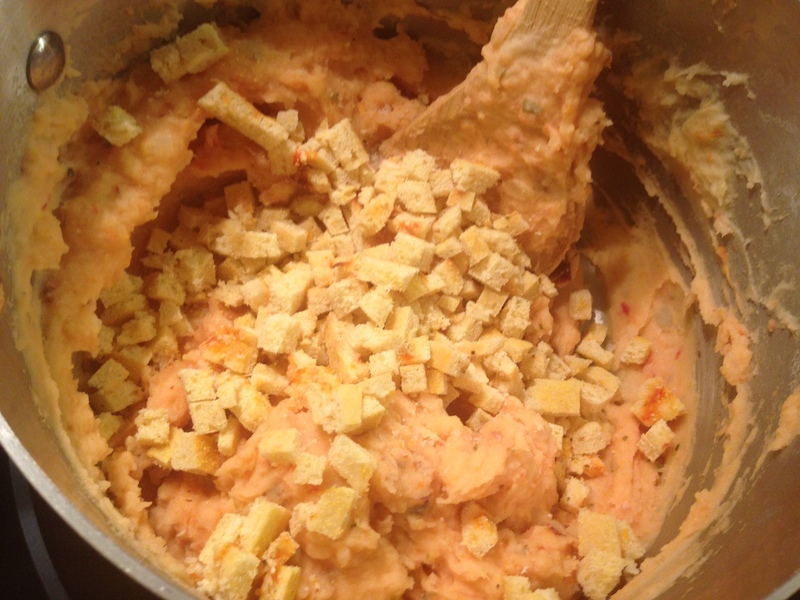 First use a knife to remove the crusts, then crape the toppings off, cut into small squares, and set aside. 2. Cube a potato and cook in heavily salted water. 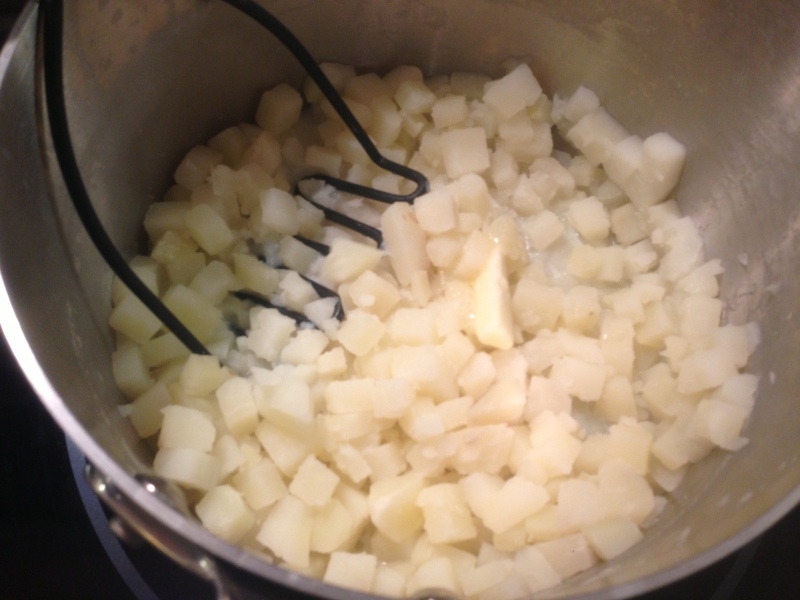 Strain the potatoes and mash with a bit of oil and milk. 3. Chop up about half of an onion and cook with a tablespoon or so of oil until translucent. 4. Add pizza toppings, cooked onions, salt, pepper, garlic powered, and a heaping teaspoon of tomato paste to the mashed potatoes. Mix using a wooden spoon, allowing the heat from the potatoes and onions to melt the pizza toppings. 5. 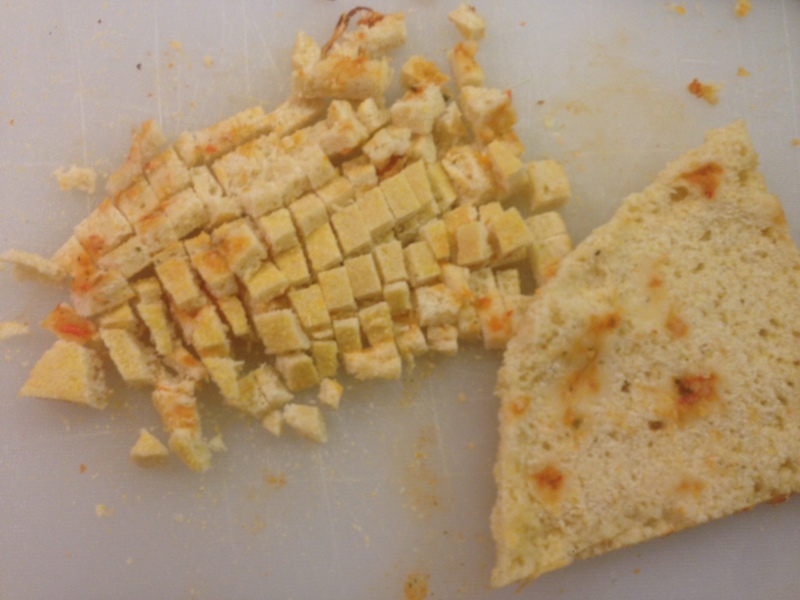 Cube the bottom of two pieces of pizza then add to the potato mixture. 6. 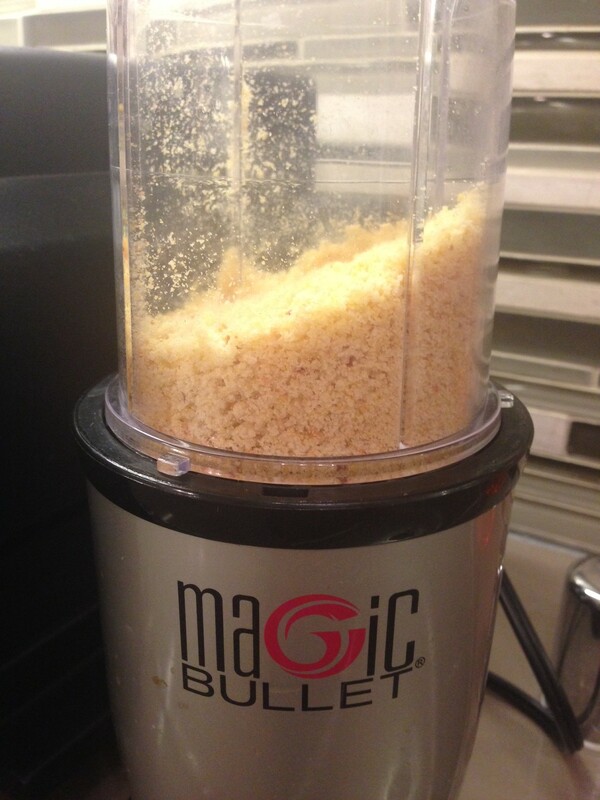 Do a rough chop on the hard crusts, then transfer to either a food processor or blender (I was cooking at my boyfriend’s place and he has a handy Magic Bullet that was perfect for this task) and blend until the crusts are completely broken down into a crumb consistency. 7. Set up a dredging station with three bowls. 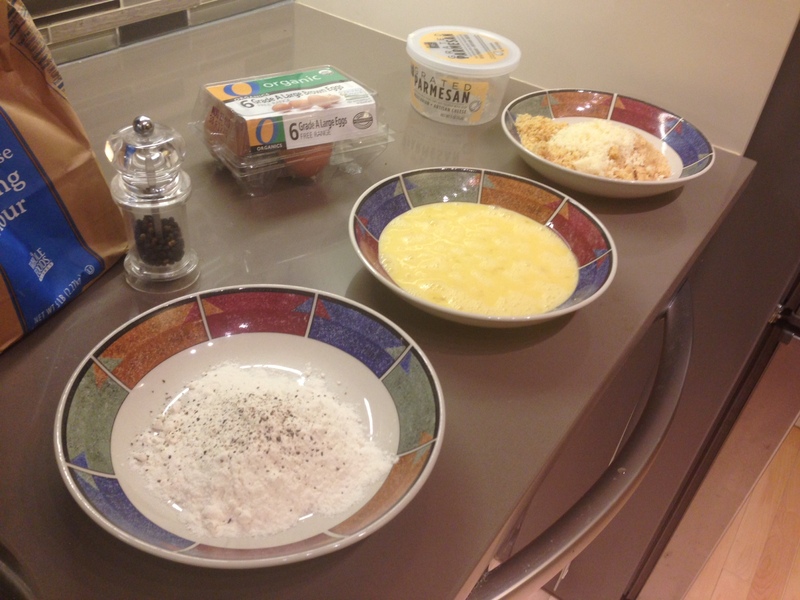 In the first one use about a cup of flour and some freshly ground black pepper, in the second whisk up an egg, and in the third combine the crust bread crumbs and a teaspoon or so of ground parmesan. 8. 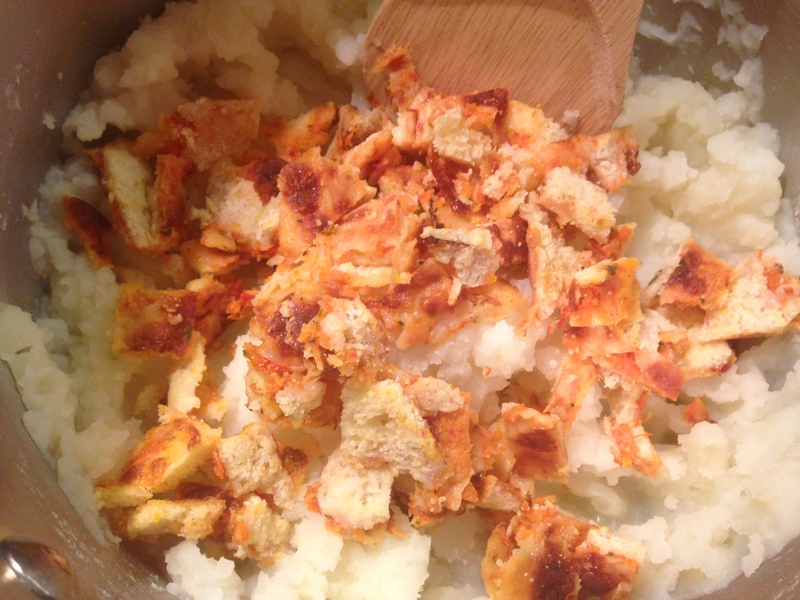 Grab about two or three tablespoons of the potato filling with your hands. Roll into a ball, then flatten. I recommend doing no more than 3 at a time so you don’t crowd the pan. 9. 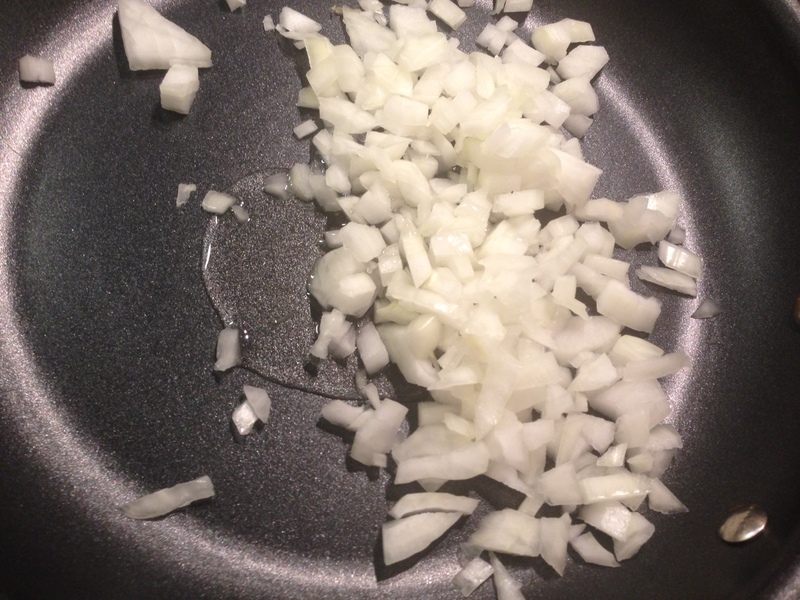 Heat up a few tablespoons of oil in the same pan you cooked your onions in. 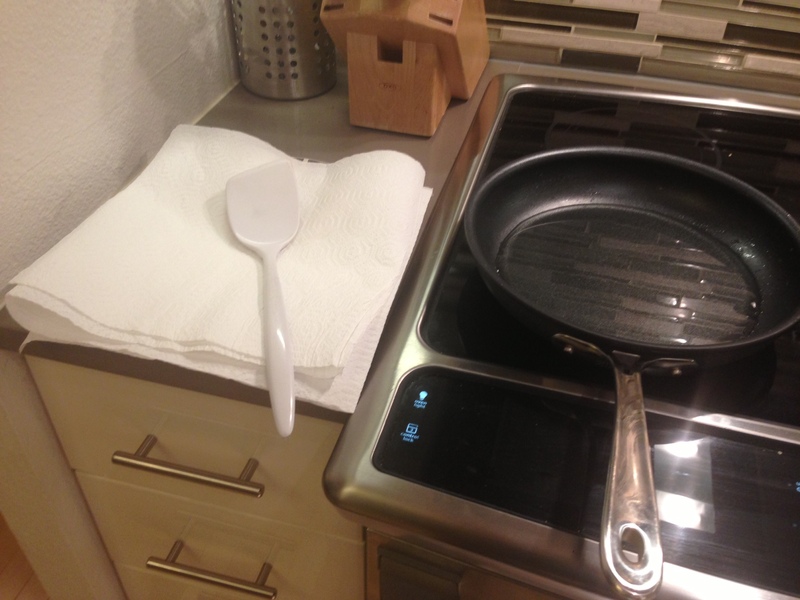 Put a plate topped with paper towels next to the pan so that you can easily transfer the cooked cakes without making a mess. If you oil is not hot enough when you place the cakes into it, then they’ll absorb too much oil and come out soggy. On the other hand, you don’t want the oil too hot as it will splatter and make a mess in your kitchen. I recommend heating the oil with medium/high heat, then testing it before cooking any cakes. 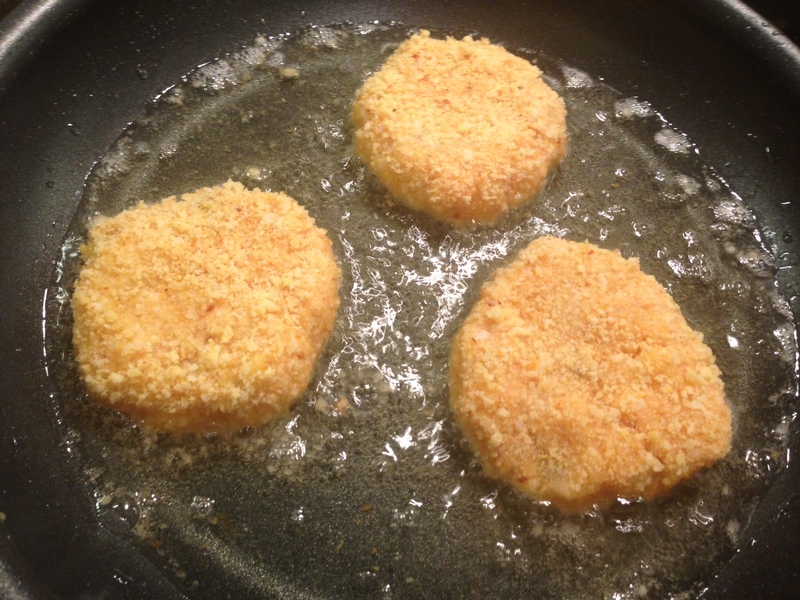 To test the oil, take a small ball of filling, dredge it lightly in flour, then drop into the pan. If the oil doesn’t immediately bubble around the test ball then the oil is not yet hot enough. 10. Carefully take the cakes one at a time, and coat in flour, then egg, then bread crumbs, making sure to shake of the excess between each. 11. 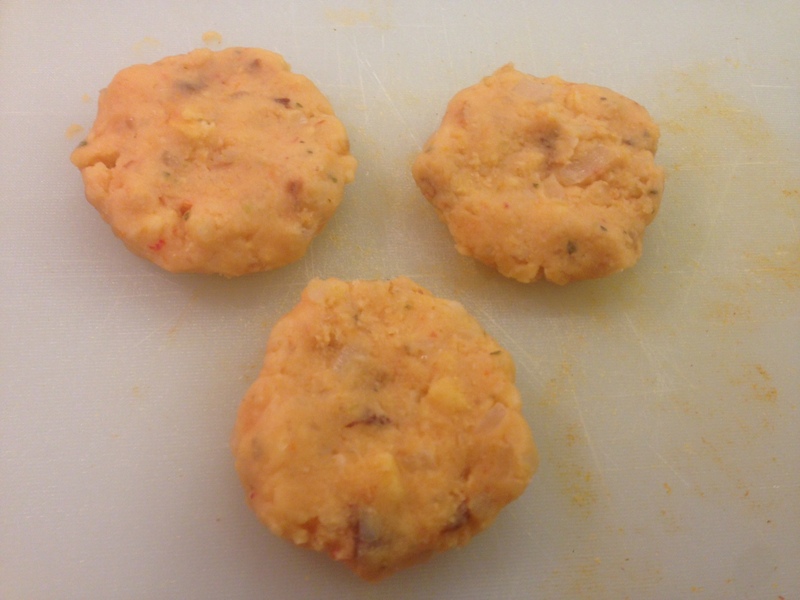 Place cakes gently into the hot oil, and allow to cook until browned. Flip, and let brown on the other side. You should only need to cook each side once, so don’t flip until the bottom is thoroughly browned. 12. Removed cooked cakes from pan, and place on a paper bowl to remove excess oil. While hot, sprinkle each cake lightly with kosher salt. Can you think of any other interesting ways to repurpose leftover pizza? Leave a comment and let me know! Newer: Veg eats in Los Angeles / the best vegan sushi I’ve ever had! cheese and balsamic vinegar reduction. I must say this is the most interesting repurposing of pizza I have come across. I think I must try.